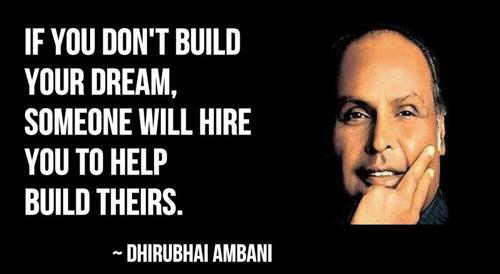 Dhirubhai Ambani (28 December 1932 – 6 July 2002) was an Indian business mogul and enterpreneur. He is one of the most famous rags to riches success story. Here I have compiled down some of the popular Dhirubhai Ambani quotes and sayings. Just hope you will like the quote compilation and will share some of Dhirubhai Ambani quotes with your family and friends. For those who dare to dream, there is a whole world to win! Don’t give up, courage is my conviction. True entrepreneurship comes only from risk-taking. Pursue your goal, even in the face of difficulties. Convert difficulties into opportunities. We cannot change our rulers, but we can change the way they rule us. Give the youth a proper environment. Motivate them. Extend them the support they need. Each one of them has infinite source of energy. They will deliver. I am deaf to the word no. Keep your morale high, in spite of setbacks. At the end you are bound to succeed. We must learn to trust. For several centuries, Indians have been brainwashed to distrust other Indians. This saps national energy. Distrust kills initiatives. Distrust compels people to maneuver and manipulate. Trust and transparency stimulates entrepreneurship. My commitment is to produce at the cheapest price and the best quality. A vision has to be within reach not in the air. It has to be achievable. Tax is for the poor or the stupid people. You do not require an invitation to make profits. We must always go for the best. Do not compromise on quality. Reject if it is not the best — not only the best in India, but globally. There is no question about that (retirement). Business is my hobby. It is not a burden to me. In any case Reliance now can run without me. A motivated manpower is the most important thing. One must have ambition and one must understand the minds .. of men.